Churches built in the name of the passing (dormition) of the Virgin Mary are some of the most popular in the Russian world. The beauty of these buildings will surprise you. 14 Cathedrals and Monasteries are featured here. The scholarship of the commentary and descriptions is also absolutely first-rate, from the invaluable Matfey Shaheen. The Dormition of the Most Holy Theotokos (Mother of God) is a feast of great importance to the Church, as well as to people of Rus’. On this day, we celebrate the falling asleep of our Most Holy Lady, the Ever-Virgin Mary. This is not, however, a sad occasion, but rather a cause for celebration! It is a marvelous wonder! Think about it! She, who in giving birth to God was like Jacob’s ladder—bridging heaven and earth—now at last ascended the ladder of divine ascent into paradise. She fell asleep, she ascended, but she still never abandoned us, her people. Indeed, the Troparion (hymn) of the Dormition teaches us that just as she preserved her virginity in giving birth, she did not forsake the world, but she continues to pray for us to this moment! 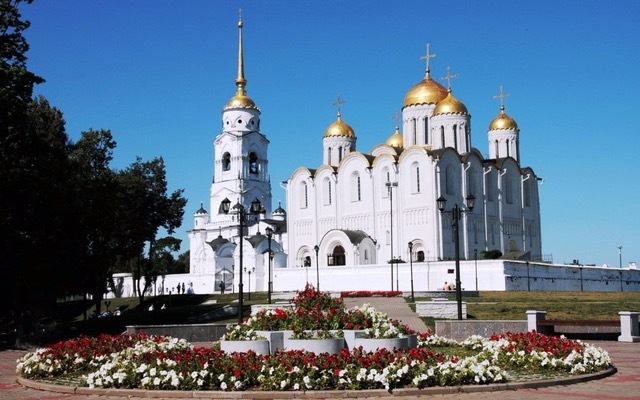 She is very close, especially from a Russian perspective, as it is a well-known fact, that in the center of almost every ancient Russian city, there is a cathedral dedicated to the Dormition. These glorious temples are often found behind Russian citadels or Kremlins, from which she looks over her patronage—the God-Protected Russian lands. She, the door from which salvation entered the world, herself marvelously passed through the door of eternal life; “The door passes through the doorway”, as the Lamentation Service of the Dormition teaches us. 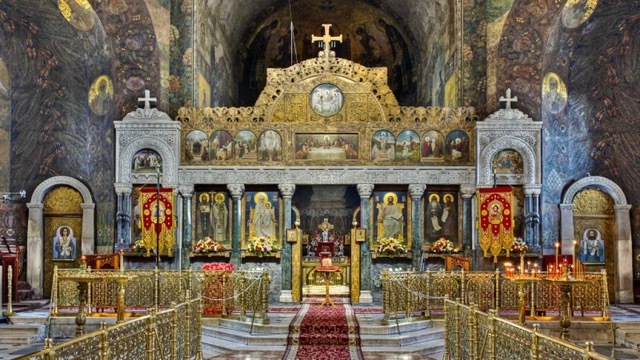 In celebration of this great feast, let us virtually pass through the doors of some of the most beautiful Cathedrals, Monasteries, and Holy sites in the Rus’ Lands, dedicated to Her Dormition. Through Her prayers, may She protect us all! 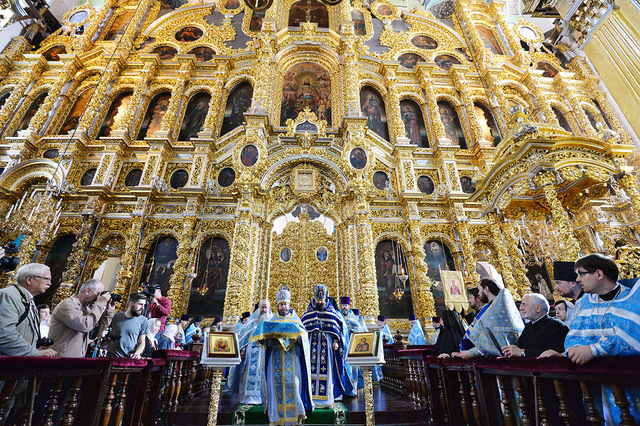 It is only fitting that we start at the very beginning—the cradle of Russian Christianity. 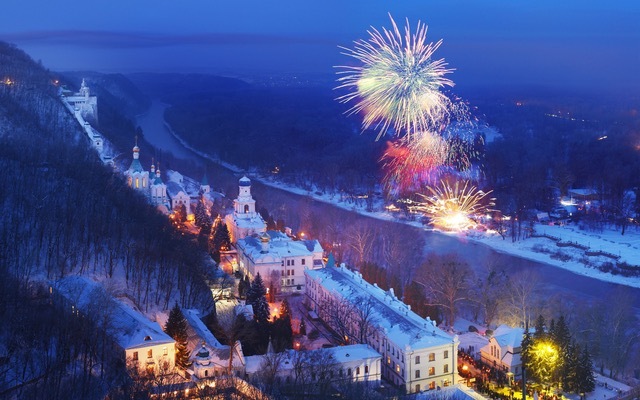 It was here, in Kiev, during the Baptism of Rus’, that the flame of the Russian Faith was first kindled by God, and from Kiev it spread like little embers to all Rus’, dancing across the Ukrainian fields. 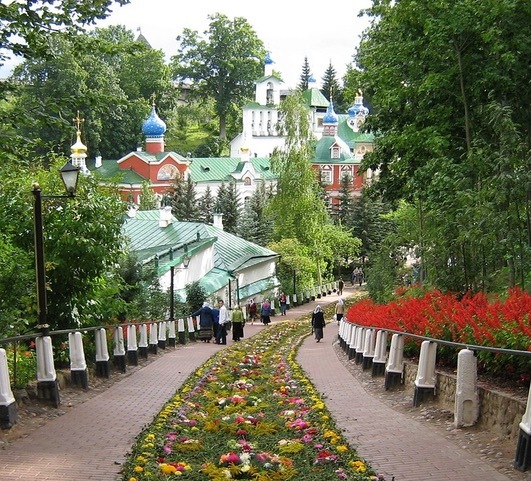 The Kiev Caves Lavra. Photo: makalius.lt. 1030 years ago, a heritage was founded in Kievan Rus'. Holy Russia was born, and a bright red sun dawned in golden radiance, over the green hills of Kiev, resplendent upon the blue waters of the great Dniepr River (Dnipro in Ukrainian). 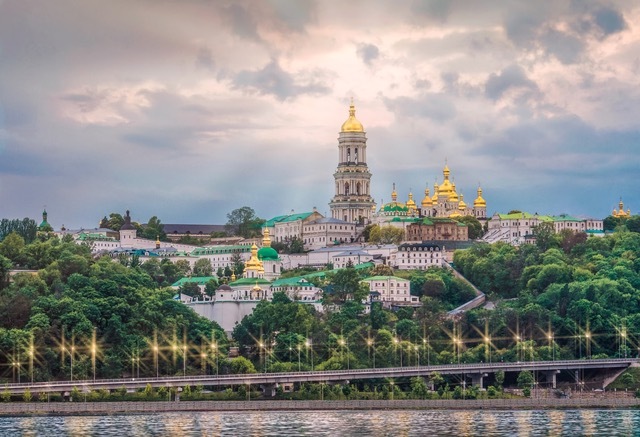 In Kiev, the waters of the Dniepr River became like a second Jordan, from which the Holy Spirit descended on the Rus’ lands, and soon, the Great Kiev Caves Lavra (monastery) would emerge on the left bank. 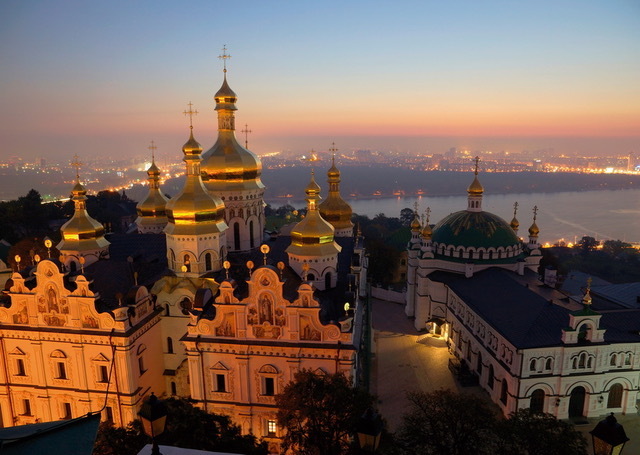 The Kiev Caves Lavra. Photo: ukrainetrek.com. The Lavra (a type of monastery consisting of a cluster of cells or caves) was founded in 1051, under the reign of Yaroslav the Wise as the first Russian Monastery, founded by Saints Anthony and Theodosius, who themselves are venerated as the fathers of Russian monasticism, brining to Kiev the monastic tradition of Mount Athos. 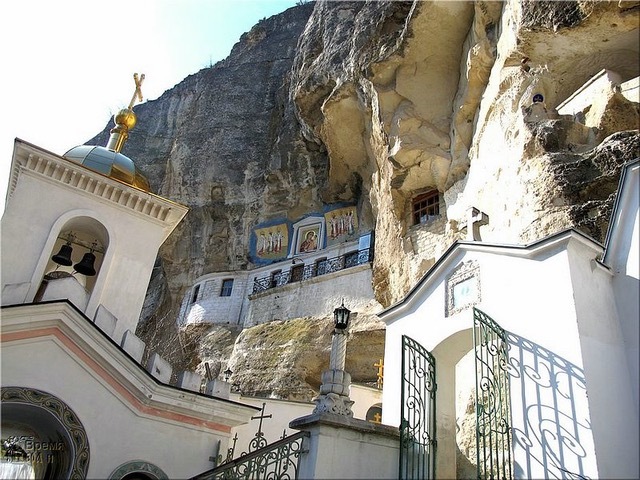 Trapeza church, Kiev Caves Lavra. Photo: поисков.рф. 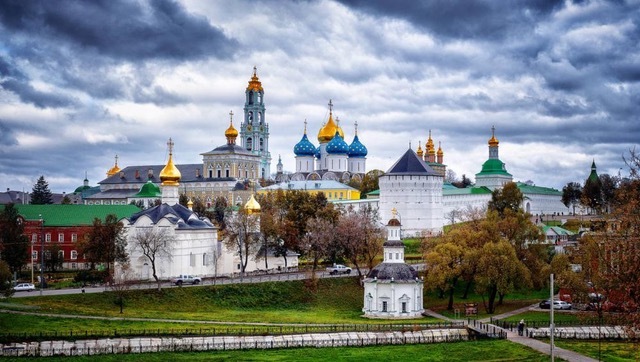 It is worth comparing the beautiful Kievan Lavra to the Holy Mountain of Athos, as there are only four places in the world given the Slavic title portion of the Mother of God, meaning these places are not only under her protection, but also her special and intimate domain. They belong to the Bogoroditsa, we would say in Slavonic, or Theotokos in Greek—the “Birth-giver of God”. 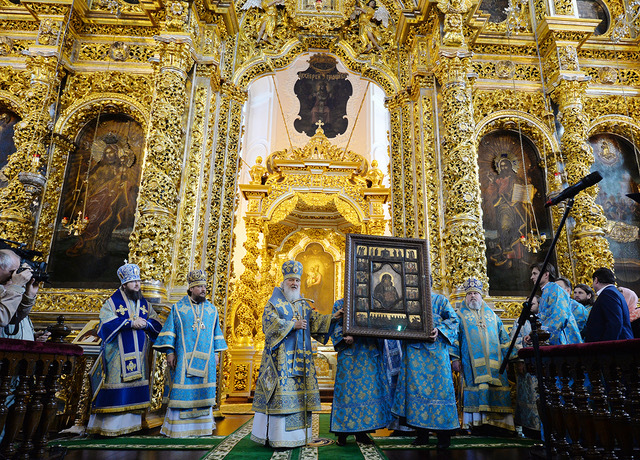 These are, in order of age, Iveria of Georgia, Mount Athos, the Kiev Caves Lavra, and Divyeevo. 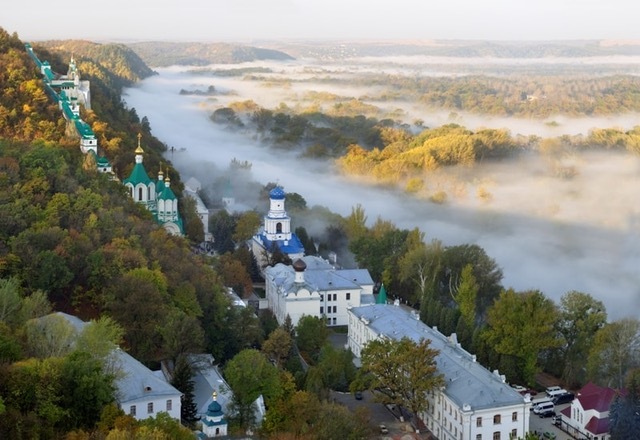 Kiev Caves Lavra is as if surrounded with the grace of uncreated light, and the glorious site is beyond marvelous. While the main cathedral of the Ukrainian Orthodox Church today is the Trapezna Tserkva, the most famous cathedral in the Lavra complex is indeed Dormition Cathedral, a masterpiece of Ukrainian (also called Cossack) Baroque, distinguished by it’s famous bud- or pair-shaped domes, as opposed to the more typical onion domes of Russian churches. Sadly, Dormition Cathedral was destroyed during World War II, however it was rebuilt, incorporating as much of the original stone as possible, which is reflected in exposed the bricks of the original façade. 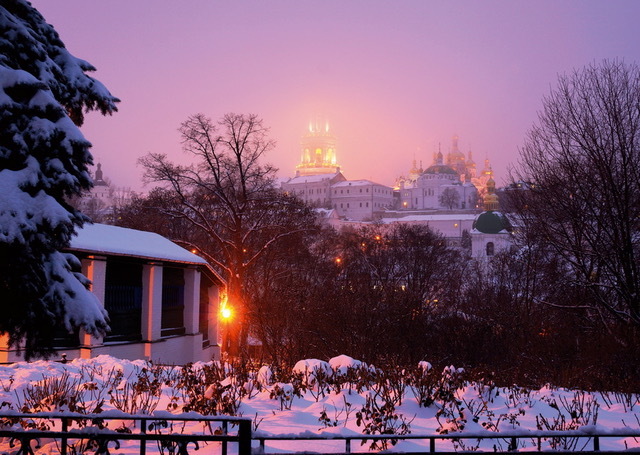 The silhouette of the beautiful domes is an icon of Kiev, beautiful during the day or night. 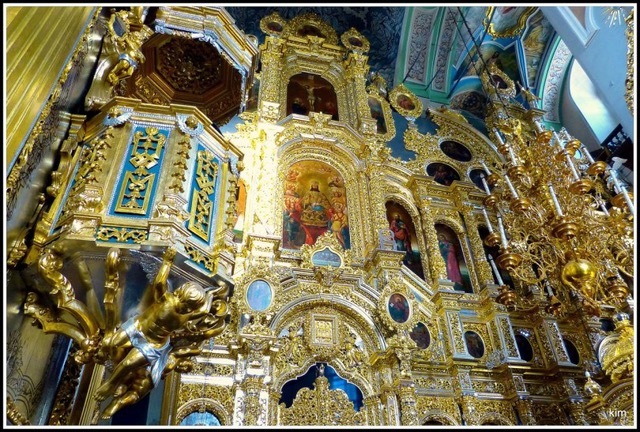 The interior of the Cathedral is just as beautiful as the exterior, with a magnificent golden iconostas, as is to be expected with the triumphant style of Baroque. 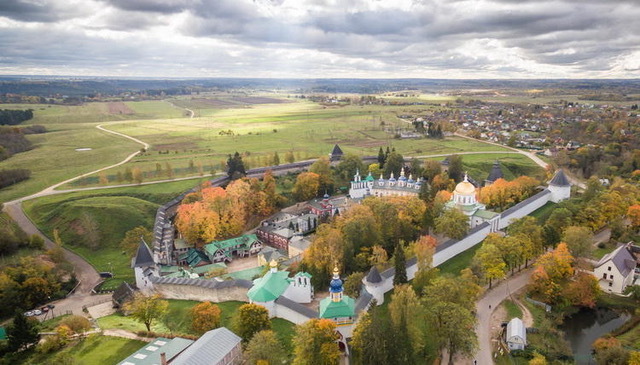 Photo: Screenshot from lavra.ua virtual tour. 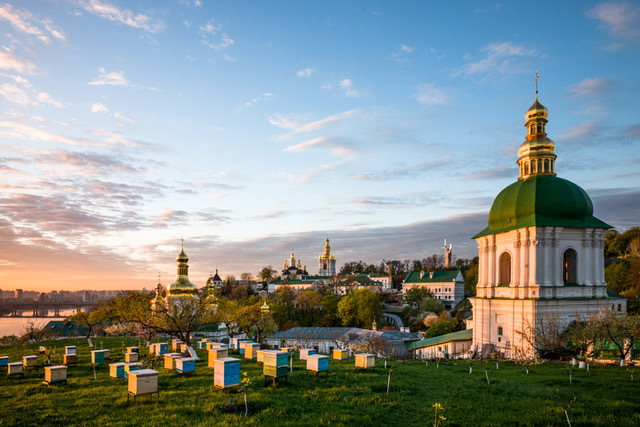 You can take a virtual interactive tour of the Lavra and its massive surrounding grounds and gardens here at their official site. A very interesting and beautiful feature in Dormition Cathedral is the magnificent gold relief depicting the Arc of the Covenant in the Proskomedia/deacons room of the altar. 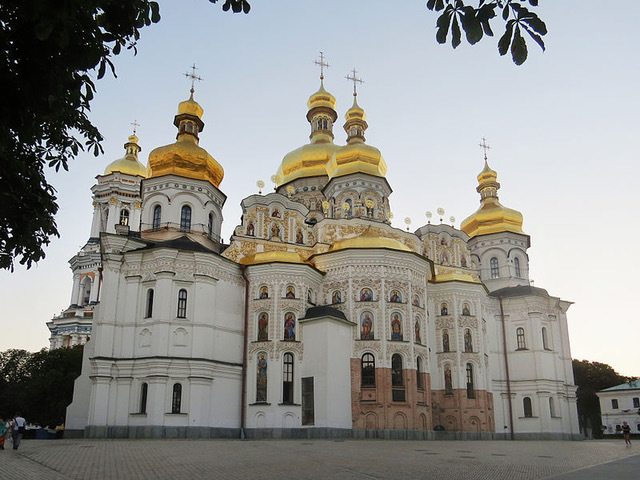 The Lavra itself, and even simply Dormition Cathedral is filled with so many beautiful sites, an entire article could be devoted to this. 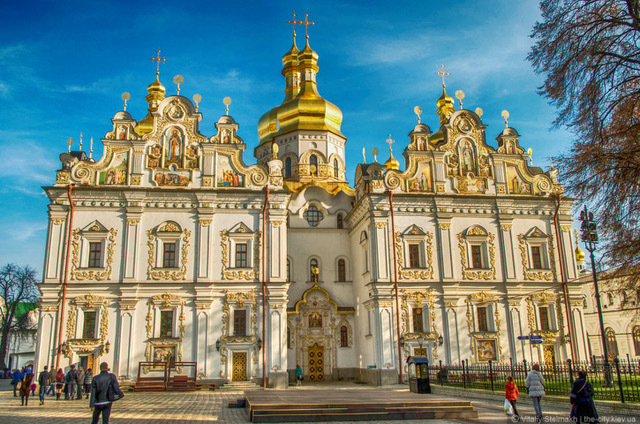 If the Kiev Caves Lavra is the birthplace of Russian monasticism, Dormition Cathedral in Vladimir is the classic architype for the other Dormition Cathedrals in Russia. Vladimir Dormition Cathedral. Photo: Anywaytour.ru. Vladimir is a city and province near Moscow, and was the original principality from which Moscow arose. Under the reign of Vsevolod the “Big Nest”, Vladimir rose to power to eclipse Kiev as the main Capital of Rus’. By the early 1300s, Kiev had already fallen to the Mongols (1240), and the former Rus’ lands would soon be invaded and occupied by Poland-Lithuania for a period of roughly 300 years. 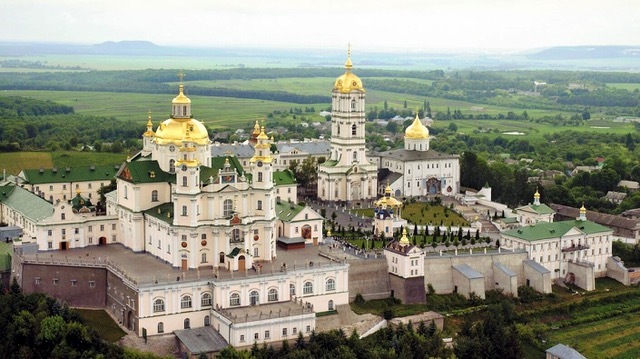 For this reason, the Primate of the Russian Church, the Metropolitan of Kiev and all Rus’ transferred his Cathedra from Kiev to the city of Vladimir. 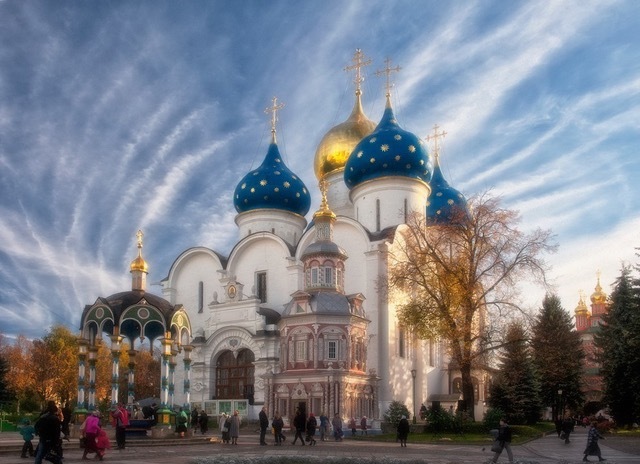 The Dormition Cathedral was built in the twelfth century by the Prince Andrei Bogolyubsky, who transferred the Vladimir Icon to the city from Kiev, giving it the name “The Vladimir Icon of the Mother of God”. More information and photos of this cathedral can be found in this article by the acclaimed Professor William Brumfield. Moscow would eventually rise to power and eclipse Vladimir, its parent city, as Vladimir did before with Kiev; the influence of the White Church of Vladimir can be seen in Moscow’s Dormition Cathedral. 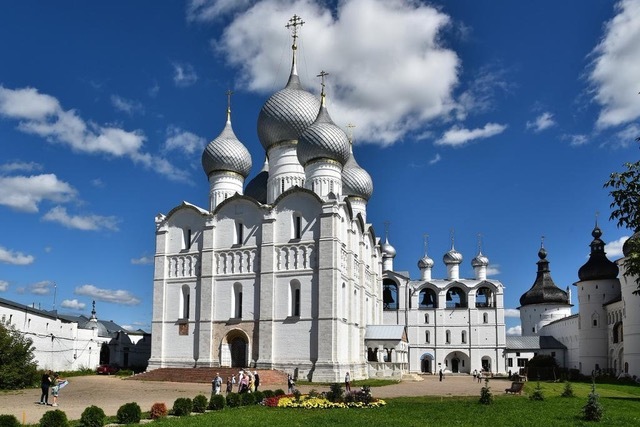 Saint Alexander Nevsky, a younger son and unlikely hero was described as the Sun of the Vladimir-Suzdal lands, and after his death, “it was their end”—they never rose to greatness over Rus’ again. And so it was, that when the sun set on Vladimir, it rose on Moscow. When Moscow was inherited by Prince Daniel, the youngest decedent of Alexander Nevsky, history repeated itself. Few thought the city or it’s prince would become the ruler of a united Russia, just as few thought Alexander would rise to greatness, but rise it did. 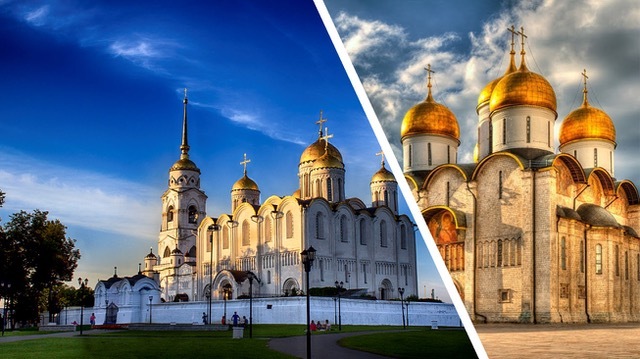 Moscow was called the “forty forties”, because it supposedly had over 40 times 40 churches within it’s walls—and Dormition Cathedral is one of them. 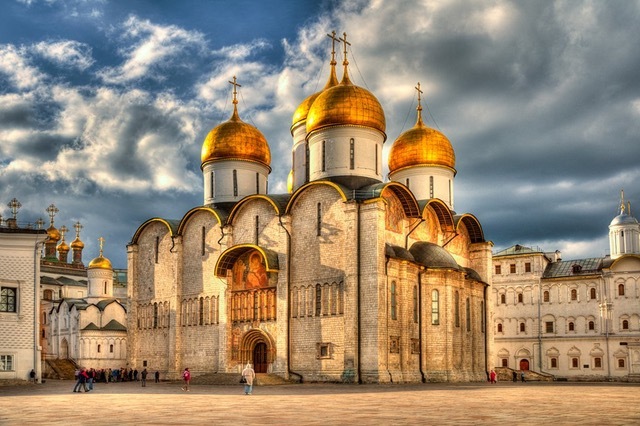 Dormition Cathedral is the primary cathedral on the Moscow Kremlin’s Cathedral Square. 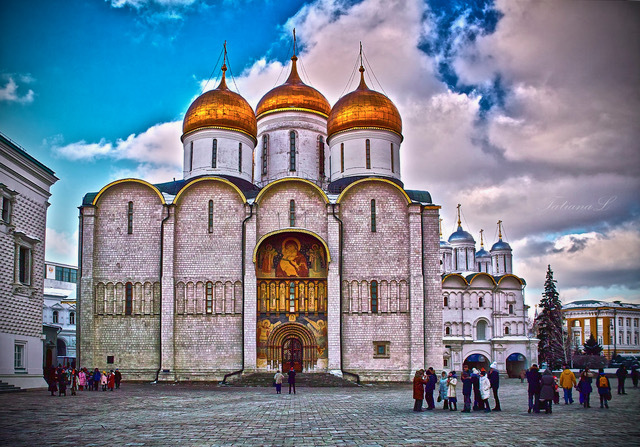 A fact few outside of the church realize, is that it is technically the Patriarchal Cathedral of the entire Russian Orthodox Church , even though the much larger Cathedral of Christ the Savior is the primary cathedral of the Patriarch of Moscow. 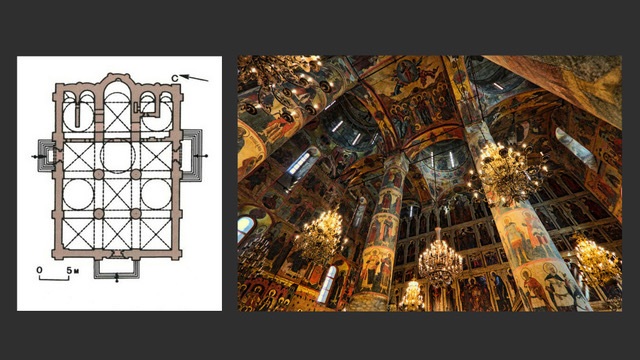 The influence of the Dormition Cathedral in Vladimir on this church structure is undeniable. 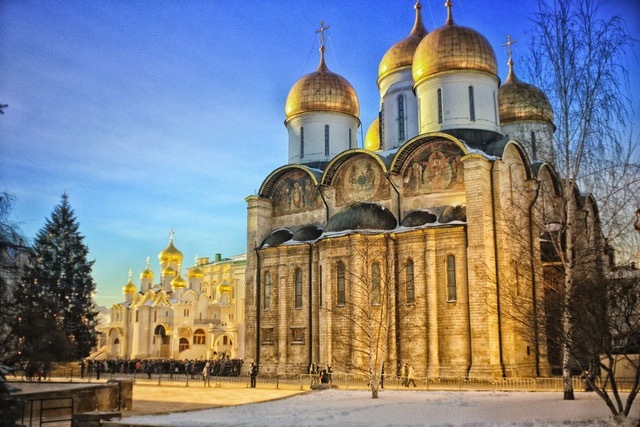 The Cathedral follows the typical national layout of Russian Churches, meaning among other things, the church has several main arches incorporated into its superstructure. The interior of these “arched churches” almost always include massive pillars which are elaborately decorated with Holy Icons. While these aspects are needed for structural support, they have also taken on a theological meaning. Four arches representing the Holy Evangelists, Three the Holy Trinity, five domes representing the Evangelists and Christ, etc. 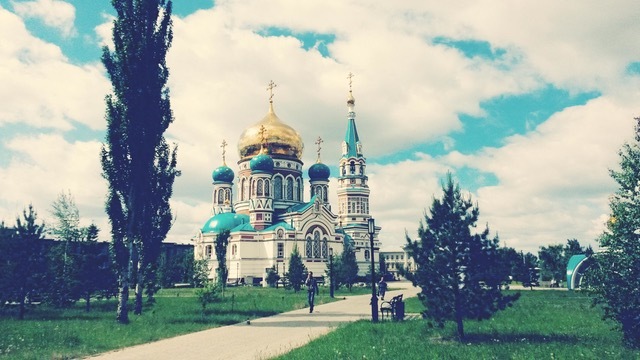 Dormition Cathedral is surrounded by other beautifulchurches, as well as the Ivan the Great bell-tower, formally the tallest building in Russia, but it can be distinguished by several features. The “roof” of the church appears to be a very dark grey color, the bricks of the cathedral are visible, and darker than those of surrounding buildings, and the base of the completely gold domes are whitewashed. This all makes the Dormition Cathedral distinct and compliments its venerable status. 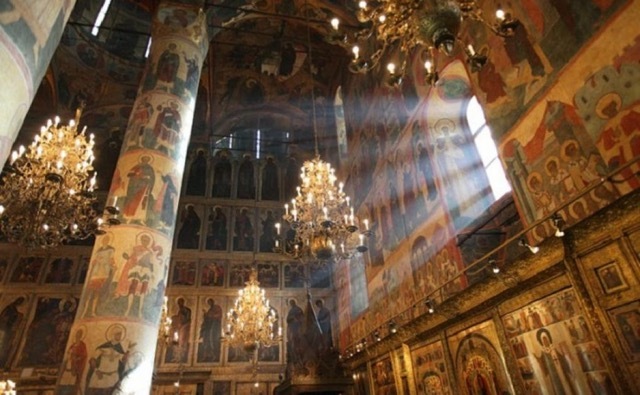 The interior of the Cathedral is filled with some of the most magnificent frescos and iconography in Moscow. Interior of the Dormition Cathedral, Moscow Kremlin. Photo: Pradiz.com. 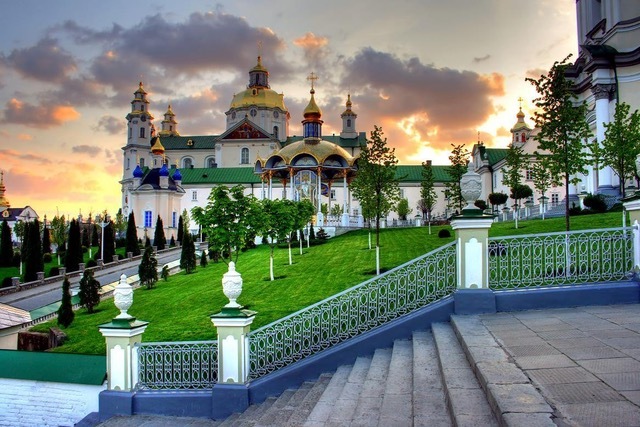 The second oldest (by date of founding) Lavra in the Russian lands is the legendary Pochaev Lavra. Far away in Western Ukraine, where mighty rivers flow through green ravines in the hills of Old Volhynia, there lay a stone with the footprint of the Mother of God herself! On that rock was built a refuge, and a church further up still, wall upon wall, glacis upon glacis, arising from the iridescent hill. Pochaev may be one of the most beautiful places in the entire world. 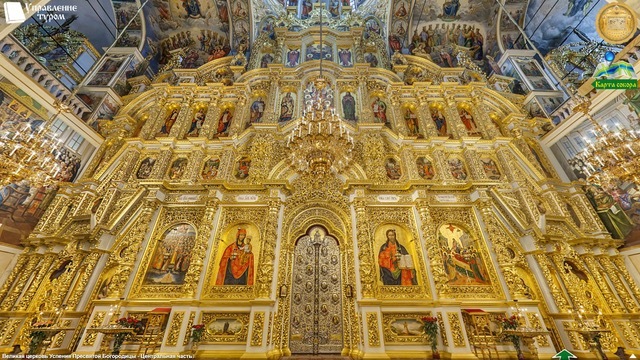 Below is a photo of the main Dormition Cathedral. Pochaev was founded in 1240 by monks fleeing the Fall of Kiev, which had been sacked by the Mongol Horde. They took refuge on the forested hill hidden in the Krementsky Mountains, having grown wary, and they were amazed by the apparition above of the Most Holy Virgin Mary. The Theotokos left her footprint on a stone in Pochaev, which pilgrims can visit to this day. 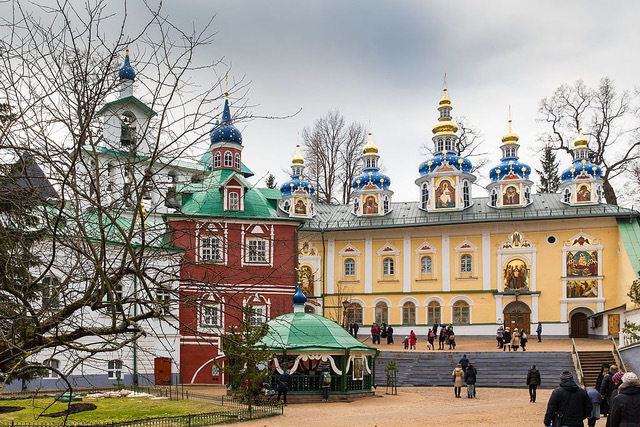 Pochaev Lavra, with icons of St. Job and the miraculous appearance of the Mother of God. Photo: sv-uspenie.cerkov.ru. 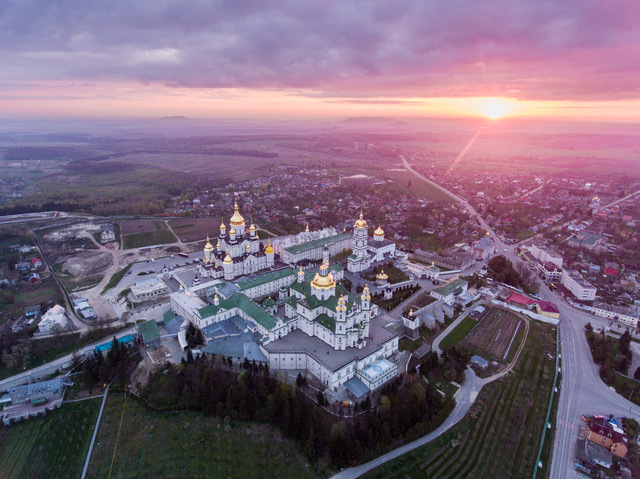 Pochaev is perhaps best known for being the westernmost fortress of Russian Orthodoxy in an era when violence against Orthodox people by both Catholic and Muslim armies was common. Saint Job of Pochaev was a famed enemy of the Union of Brest’, and one of the greatest champions of Orthodoxy and Eastern Slavic literacy during the days of Polish-Lithuanian occupation. 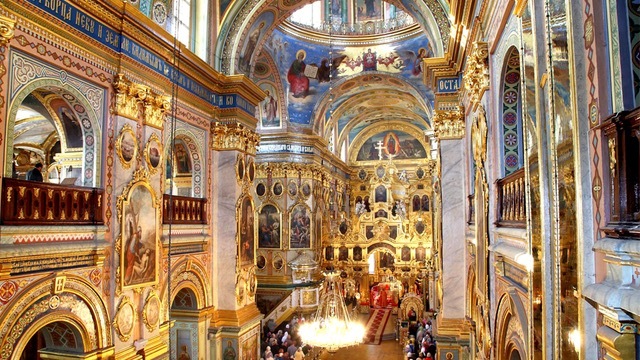 Indeed, the interior of Pochaev’s Dormition Cathedral was built with heavy Polish influence. Pochaev is also famous for her miraculous icon, which drove away an army of attacking Turks and Tatars. When they surrounded the walls, which were too strong to take in battle, the great threat was that the monks and believers trapped inside would be starved to death in the siege. They began to pray that the Theotokos would intervene, and as soon as they spoke the words “To thee the Champion Leader”, the sun was eclipsed, and she appeared in the sky; she was greatly incandescent, her face brighter than the sun. Beside her was Saint Job and an army of angles, whom she directed to defend Pochaev. The Brethren and the Cossack defenders were saved, and they gave thanks to God. Many attacking Tatars and Turks were converted by what they saw, and they confessed faith in Christ, joining the monastery. This was immortalized in this beautiful ballad often sung in the Ukrainian language at Pochaev. It is my great honor to have served with the former choir master of the hierarchical choir of Pochaev Lavra, Protodeacon Serhii Chebotar, who I can say is the greatest Church musician I have personally heard. It is also my greater honor to call him my friend—here is a link to the Song of the Theotokossung by him and others. 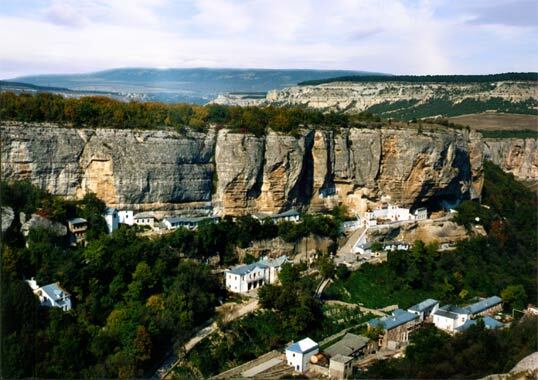 Dormition Caves Monastery is located deep within the Crimean Mountains near the old capital of the Crimean Khanate. 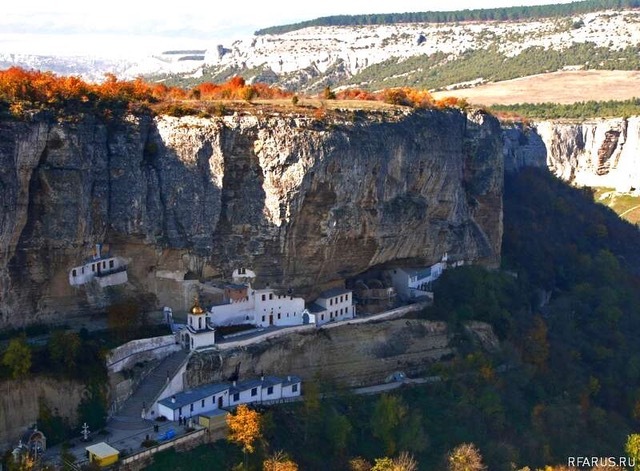 A masterpiece of Orthodox architecture, like many other examples of monasteries carved into the literal mountain or cliffside. The Monastery was originally built by Greek monks, probably in the eighth century, in a place called Saint Mary’s Vale. The monastery was close to Bakhchysarai, where the Crimean Khanate had their capital, and from where they often launched slaving raids against the wild fields and Little Rus’. The Crimean Khanate ruled Crimea, which was previously Byzantine Greek land, until the Russian Empire liberated Crimea, uniting it for the first time with Rus’ in history. 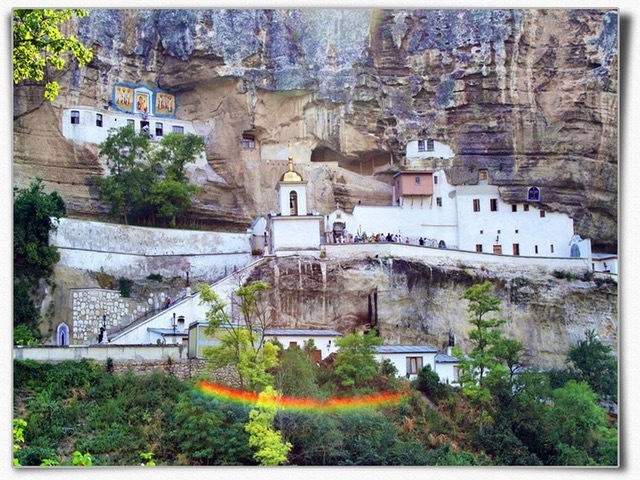 The monastery is famous for its story of a miracle working icon, through the power of which a dragon was slain. The monastery is a testimony to the many wonders of Orthodox architecture unknown in the west. The heroic city of Smolensk is located on the border with Belarus, and the former border with the Polish-Lithuanian Commonwealth. 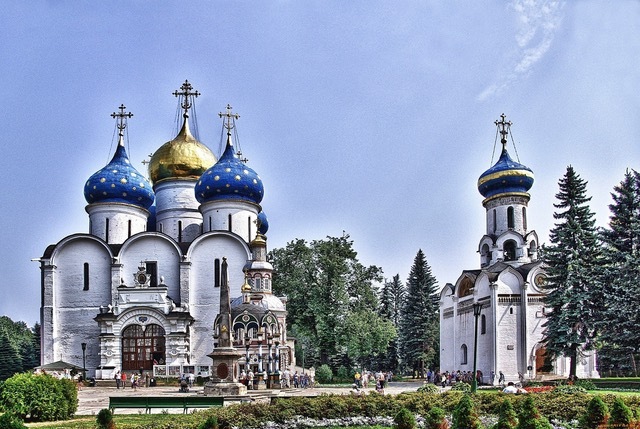 Like many great Russian cities, a Dormition Cathedral can be found in its fortified center. 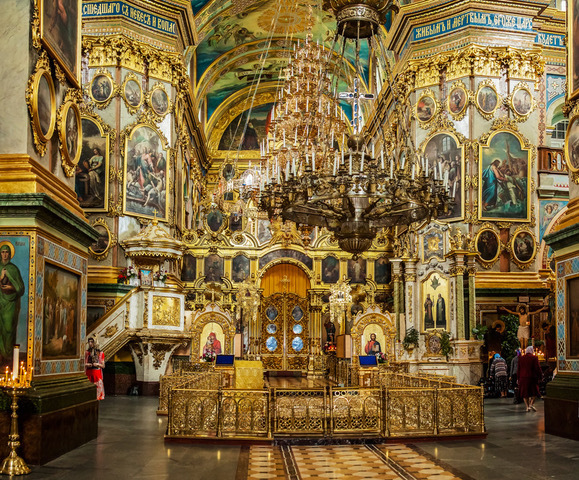 While Dormition Cathedral is beautiful on the outside, it is the inside which is particularly magnificent, with some of the most extravagant and triumphal examples of beautiful gold decorations. The Iconostas in particular is glorious. It is almost like an endless wall of gold. 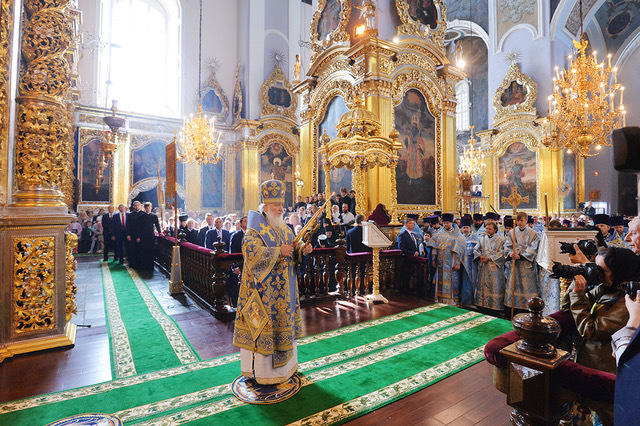 Behind His Holiness, Patriarch Kirill, who was once Metropolitan of Smolensk, you can see a golden canopy over the Altar, which is very unique and not common in Orthodox architecture. Holy Dormition Pskov Caves Monastery. Aerial view. Photo: hram-nikola.kiev.ua. 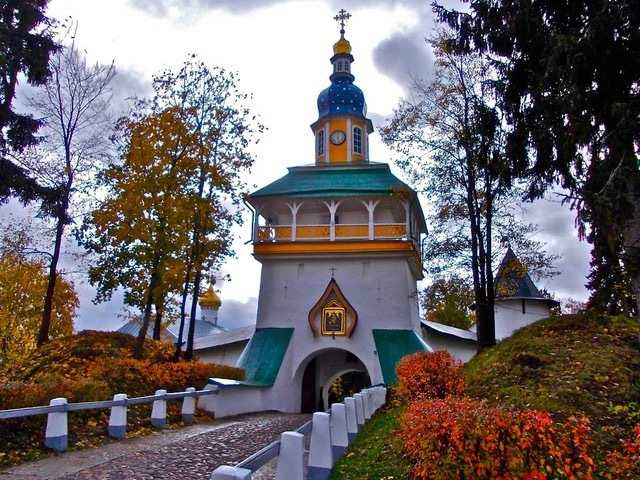 Those who have read Everyday Saints by Metropolitan Tikhon of Pskov (the founder of this website) will require no introduction to Pskov Caves Monastery, where the famous Father John (Krestiankin) lived. The "Road of Blood" leading into the Pskov Caves Monastery. Photo: pskovskie.ru. 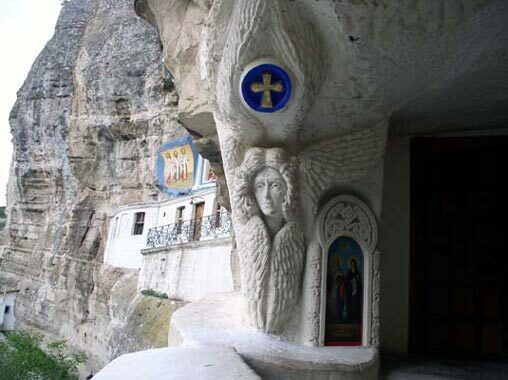 What many don’t realize is that this is yet another caves monastery associated with the Dormition of the Theotokos. The influence of Ukrainian baroque can be seen on the domes of Dormition Cathedral, even though Pskov is far to the north of Ukraine. 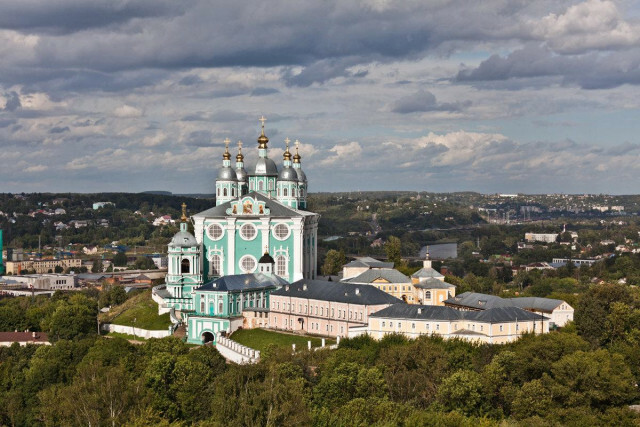 This Russian province bordering Estonia is the birthplace of Equal-to-the-Apostles Olga of Kiev, the grandmother of Saint Vladimir, the Baptizer of All Rus’. 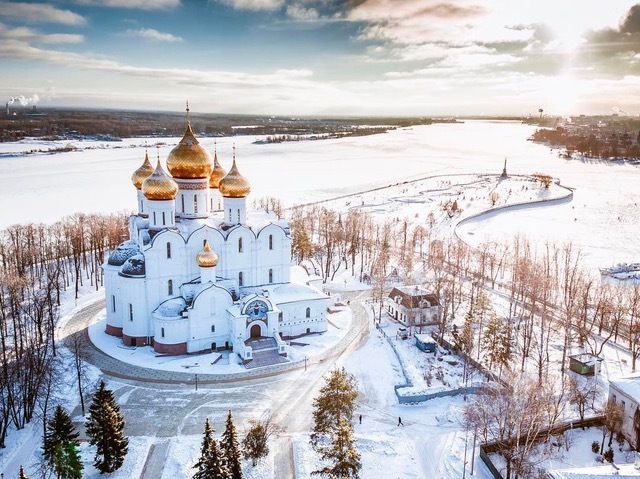 Dormition Cathedral, Yaroslavl, on the Volga River. Photo: Barontour.ulcraft. Rostov the Great is a unique city, in that Saint Sergius of Radonezh, Wonderworker of all Russia was born in Rostov. 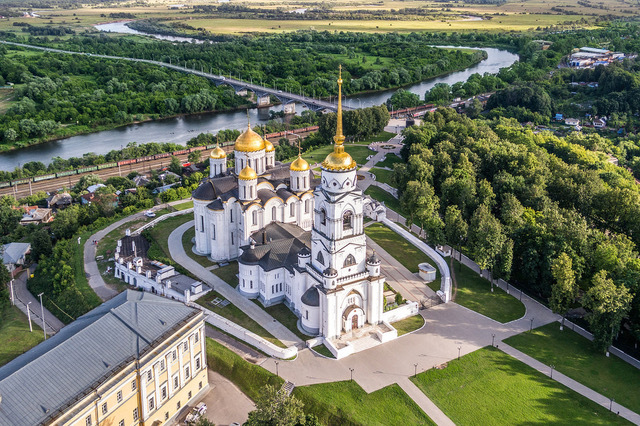 Within the Rostov Kremlin there is Dormition Cathedral, and the surrounding fortress is quite impressive as well. Saint Sergius of Radonezh, Wonderworker of all Russia, is considered one of the greatest Russian monastics and is one of the most well-known Russian Saints. 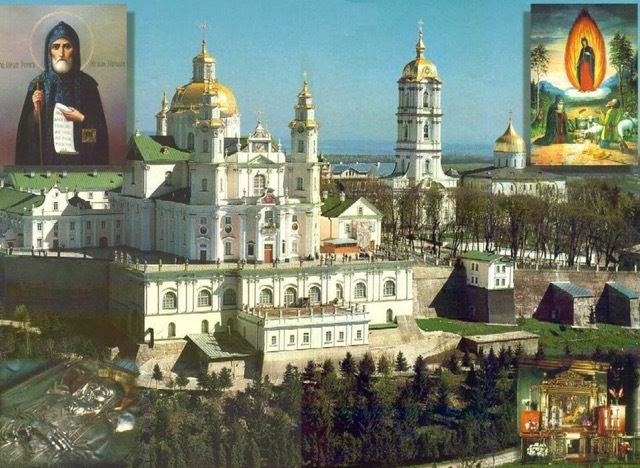 His influence on the Russian lands is profound, and just like Pochaev Lavra, the Holy Trinity-St. Sergius Lavra in Moscow Province became a central fortress in the defense of Orthodox Rus’ both spiritually, and literally. Holy Trinity-St. Sergius Lavra. Photo: Ysia.ru. The Dormition Cathedral, inside the Lavra, is famous for its beautiful azure domes, which mirror the countless stars of the heaven’s seas. Dormition Cathedral, Holy Trinity-St. Sergius Lavra. Photo: 3bp.blogspot.com. The Holy Trinity-St. Sergius Lavra is of course dedicated to the Holy Trinity. 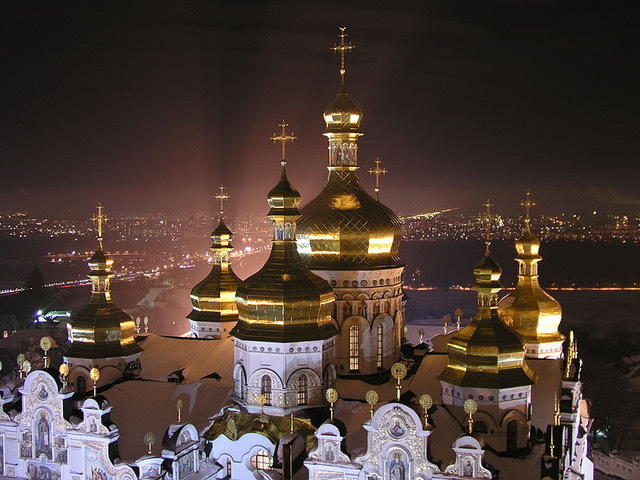 Nevertheless, the Dormition Cathedral is its largest church and catholicon. 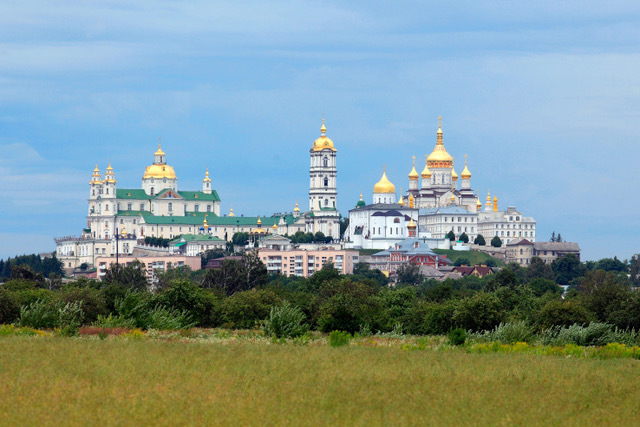 It is the most recognizable structure in Sergiev Posad, and the building with which ironically, most people associate Trinity Lavra, as opposed to the older, smaller, but still glorious Holy Trinity Cathedral itself, which is the smaller structure with several gold domes shown in picture above,close to the bottom. 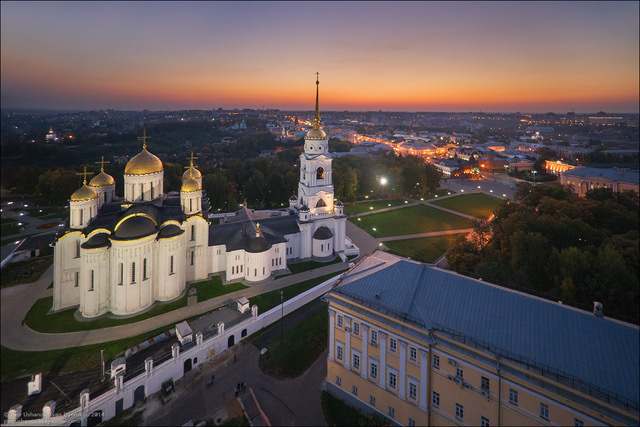 The Dormition Cathedral in Omsk is distinguished by its massive central dome, and large bellower. 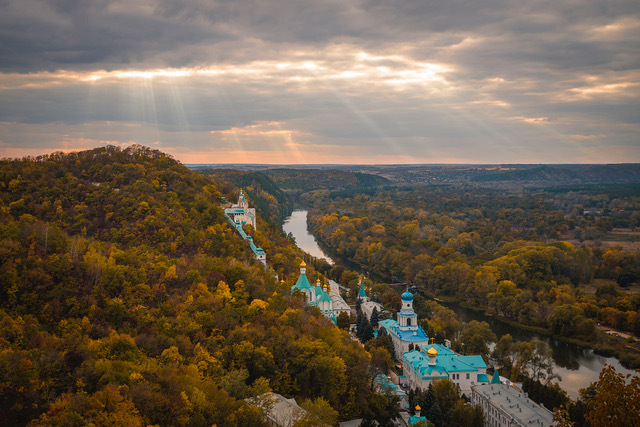 Holy Mountains Lavra is one of the most beautiful and magnificent locations in Ukraine, located not far from the birthplace of Saint John of Shanghai and San Francisco, one of the greatest modern Russian Saints. 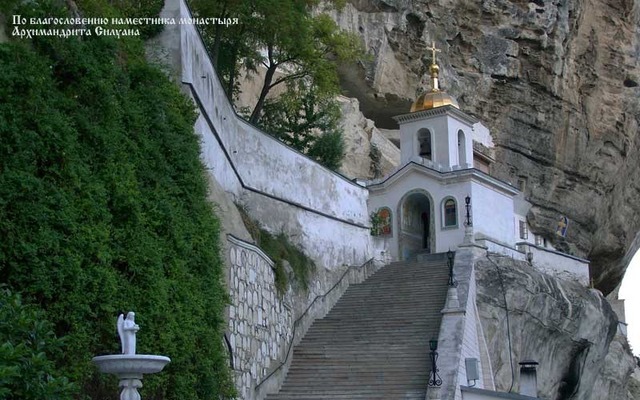 The Lavra is located on the chalk hills of the Donbass, and it truly has made the surrounding hills a holy place. 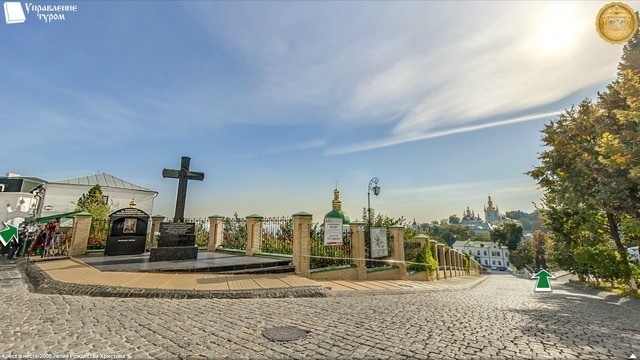 During the All-Ukrainian Cross Procession, on the day of the Baptism of Rus’, two cross processions met in Kiev, one from Pochaev in the West, and another from Svyatogorsk in the East. Their meeting in the center represented Orthodoxy uniting the Ukrainian people in peace. The Brotherhood of Svyatogorsk is especially aware of the suffering of innocents in Eastern Ukraine, due to their central location in the Donbass. Throughout the suffering, the mountains and hills beside Svyatogorsk became like a Second Golgotha, but once again, like the Dormition, this should not be a hopeless thing. The people remember the prophetic words of Saint Lavrenty of Chernigov, and they remember also that after the Crucifixion, comes the resurrection. This new period of suffering is only a chance to purify our souls through prayer. The faithful are reminded once again, by the words of the Troparion of the Dormition, that the Mother of God did not forsake this suffering world when she passed into the Kingdom of Heaven. Through her prayers, may Our Lord and Savior Jesus Christ have mercy on us, and save a despairing people with the hope of the Resurrection! “Kremlin” is the Russian word for Citadel, a fortress at the center of the city from which it is administrated. While there is a Kremlin in Moscow, it does not only refer to that structure. There are many Kremlins. Through St. Sergius’s prayers, the Russian army prevailed at the Battle of Kulikovo against the Mongol Tatars. 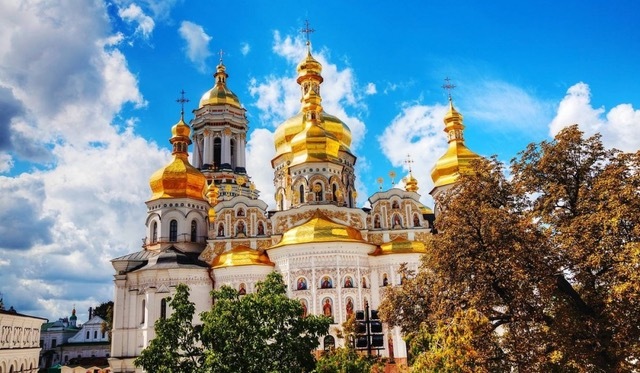 Also, during the Time of Troubles, the Lavra, its monks, and its superiors refused to surrender to the invading catholic army, and supported national Orthodox unity. 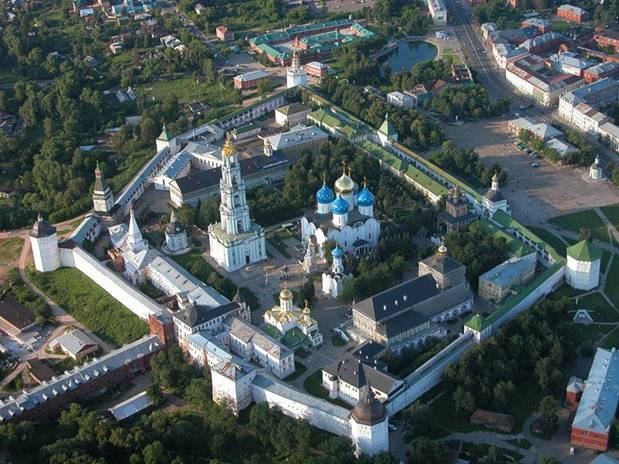 The lifting of the siege of the Lavra was one of the major steps to taking back Moscow, where the Patriarch had been starved and tortured to death by the invaders. 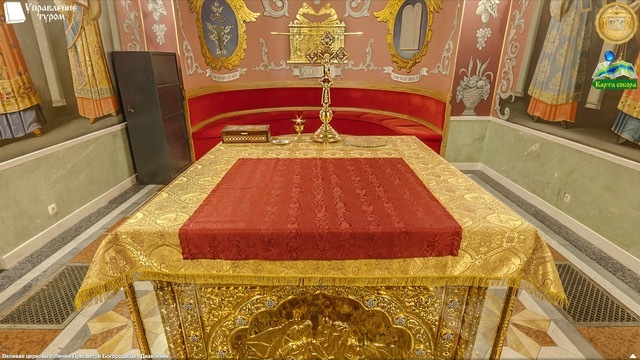 Holy Trinity Cathedral contains the relics of Saint Sergius of Radonezh, founder of the lavra.